As I have previously noted: In my other life, I am a cowboy. Specifically, a contributing editor for Cowboys & Indians, The Premier Magazine of the West. And I must admit: Some contributions are more fun to contribute than others. 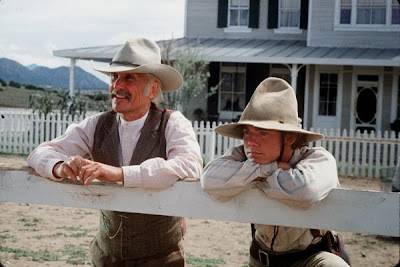 To celebrate the 25th anniversary of the classic Lonesome Dove miniseries, I recently interviewed Australian filmmaker Simon Wincer, a droll raconteur who shared all sorts of colorful stories about directing the epic adaptation of the Pulitzer Prize-winning Larry McMurty novel. But wait, there's more: I also got to write about Lonesome Dove co-stars Robert Duvall and Rick Schroeder (pictured above). And... well, I finally got a good excuse to rip the shrink-wrap off the long-on-my-shelf Blu-Ray of Lonesome Dove, and savor the miniseries in widescreen splendor on my high-def Vizio TV. Life is good.